I have two finished cowls to share today, both with fun buttons. I like them both and am disappointed with both. Let’s start with the older one. I finished knitting this last weekend but just sewed on the buttons today. The pattern called for 60 yards and some of the project pages mentioned it was a little small, so I added in a second color to hopefully stretch my 60 yards. However, I didn’t do it logically or scientifically, so it still came out smaller than I wanted and I had more yarn left over than I wanted. I should have cast on a couple more stitches and weighed the black yarn after doing the first three rows so that I’d know how much I could knit in the center black section. Instead I winged it. I mean, it’s fine. I do like the buttons I chose for it, but they’re a tiny bit too small for the buttonhole so they’re more likely to come out. But it’s cute, it’s wearable, and it was a good choice for the one 60-yard ball of bulky yarn I had in my stash. Pattern is Mochi Neck Cozy. Okay, so the second cowl I finished knitting last night at the girl’s choir concert. This morning I sewed it together and added buttons. The yarn is Malabrigo Rasta and is GORGEOUS. Love love love these colors. It knit up quickly, it’s soft and will be super warm, and I really like the matte pewter buttons I chose. So what’s the problem with this one? It’s taller and snugger than I was expecting, so it’s a bit harder to wear. It’s a tight enough gauge that it doesn’t drape very much. I think at this point I’m going to give it a bath in some Eucalan and see if I can loosen it up. Still, that’s a pretty small problem. This pattern is Comfy Cowl. I love how you can sew it together however you want; off-kilter like the designer did, or with the edges matched up evenly. The weather here has been cool and gray and rainy lately and I’m afraid it’s affecting my mood. Hope things are brighter where you are! Oh, hats, how I love making you! I’ve loved my time making shawls but I’ve missed making hats. I finished three chemo caps this week; the aqua one I already showed you, and two more. Here’s a basic gray beanie in Knit Picks Brava Worsted. It’s my own recipe based on what I’ve picked up from knitting so many hats the last few years. 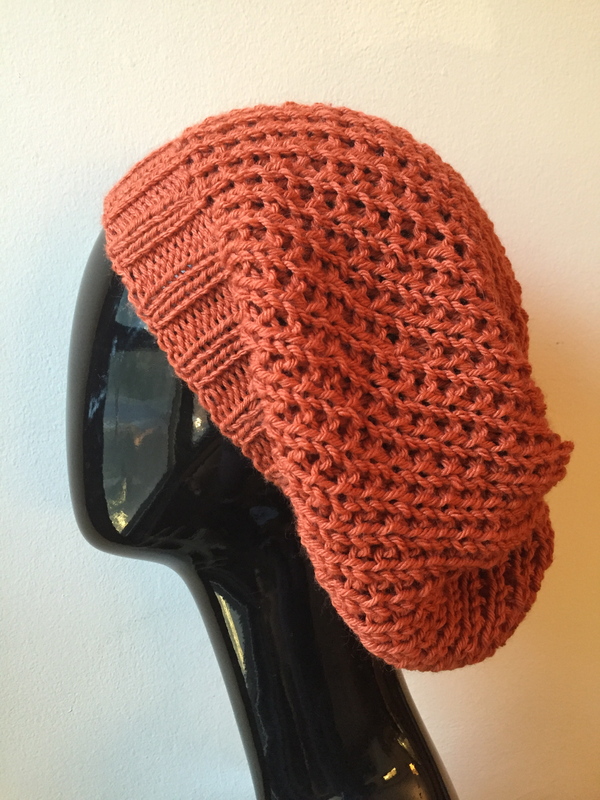 If you’re interested, you can find my notes on the Ravelry project page. 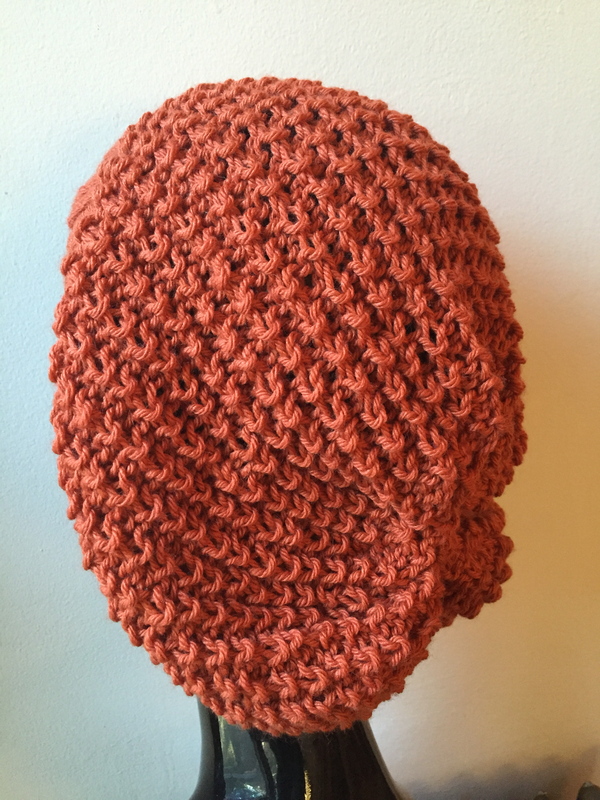 This one is definitely an adult small; cast on more stitches if you want a bigger hat. The second one is the Shelbi hat. I did this one in white Brava. I did the teen/adult small size and it is definitely small. But that’s what I was going for, and it will probably stretch with use too. My only concern is that it might be a bit short, so when I make more, I’ll probably add a couple of rows somewhere. It was just as fast and easy to make as I remembered, so once I get feedback on the fit, I’ll definitely be making more of these. You can find the Ravelry project page here and the pattern here. This morning I finally took the time to sew buttons on my two Henry Hats. I do so love the look of these hats! The green came out an adult large. It fits my husband, who has a ginormous head. But aren’t those buttons awesome?? The blue, done with worsted weight on smaller needles, came out large child/small adult size, depending on stretch. I’m kind of tempted to go down another needle size with the next one to make it a tighter fabric, and a little smaller still. It’s interesting how my gauge is so off on this one pattern; I’m thinking it’s maybe because there’s so much purling? Maybe my purling is a lot looser than my knitting and other people’s purling? This week I’m shifting gears away from chemo caps for a bit. I have a Thomas-themed hat to make for a little boy, plus I want to get back to my WIPs and see if I can get something finished. Stay tuned, it might be a week before I post again but hopefully I’ll have a FO! OH! And guess what?? I hit 300 followers on my blog recently! It might not sound like much to some, but to me it’s awesome to think that so many people like what I’m doing enough that they want to follow me. So here’s a big THANK YOU to my friends and readers!!! Not much knitting to report today, but I wanted to share my fun crafty purchases from the last two days. I had dinner with a friend last night and took advantage of the restaurant’s proximity to Joann. I *had* to: I had coupons! Of course I found stuff either on clearance or on sale, but still. I used one coupon for some size 9 16″ circs, since that was the only size I was lacking. The rest was too good a deal to pass up. Look at these fun booklets that were only $1.97 each! Buttons were 40% off, and I managed to restrain myself to just ONE button! (There was a woman in my way so I didn’t get to browse very well.) I also went through the button stash my mom gave me and there were some fun ones in there. These were my favorites. Today we took the boy out to a new (to us) art supply store downtown. He and my husband are both amazing artists; I’m a wannabe. I have no drawing/painting talent whatsoever, but I desperately want all the art supplies. I typically console myself with pens and notebooks and today was no exception. I have a problem. I freely admit it. It’s an addiction I have no desire to break. This proves it: I am weak. I couldn’t even go a month without buying new yarn. I lasted 23 days. Then I made the mistake of going to Michaels. I was just going to get some Yoda green yarn to have on hand, and darn it, all the yarn was on sale. Even with that, I resisted until the very end, when I found some lovely variegated bulky skeins. Mostly acrylic but with a nice wooly feel to them. Then I found a display with these value packs, two skeins (1060 yards total) for $5.99. That seemed like too good a deal to resist. Sure it’s all acrylic, but they’ll make great inexpensive pieces for kids and my craft shows. The bags were sealed but someone had torn one open so I made sure to get a feel for the yarn before I bought it. Aren’t these awesome colors? That wasn’t too terrible, but then yesterday we took a day trip to northwest Missouri. The girl was in an all-day honor band at Northwest Missouri State in Maryville, which is about an hour and a half away from us. At first we figured we’d stay in Maryville…but even the lone Starbucks inside the library was closed, and the biggest attraction in town was Walmart. So instead we drove to St. Joseph for the day, where we toured four antique malls and a real live yarn store! The Red Barn Yarn Farm was small but had a fantastic selection of yarns, and the staff was super friendly and helpful. Of course I needed some souvenir yarn, right? Malabrigo Worsted in Periwinkle. Malabrigo Worsted in Pink Frost. This Lustra isn’t the softest yarn against my cheek but I adore the color and the sheen. It won’t be something for me but I had to have some to play with. I did have a bit of knitting time too. I wanted to work on this hat but forgot to bring the bigger needles for when it was time to switch to the body, oops! Fortunately, I’d brought my black scarf commission with me and I made good progress on that. I forgot! I found buttons at the antique mall too! Most of the time they’re loose in jars and I don’t want to pay $15 for a jar of tiny random buttons. 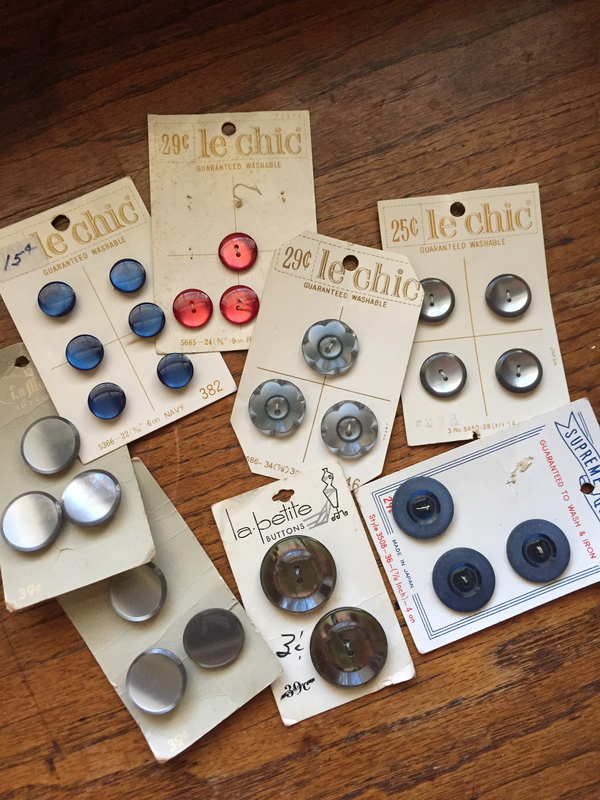 But I love it when I find the cards of vintage buttons for a good price. So yeah, I broke my streak big time. But it sure was fun! And I’m back in the mode of “Knit all the things NOW!” I’ve got so many WIPs on my needles and so many ideas for new projects that I think it’s the tiniest bit overwhelming. Today I might focus on the scarf; that’s the highest priority and getting done will ease my mind. What do you think, can I knit 3/4 of a scarf in one day? 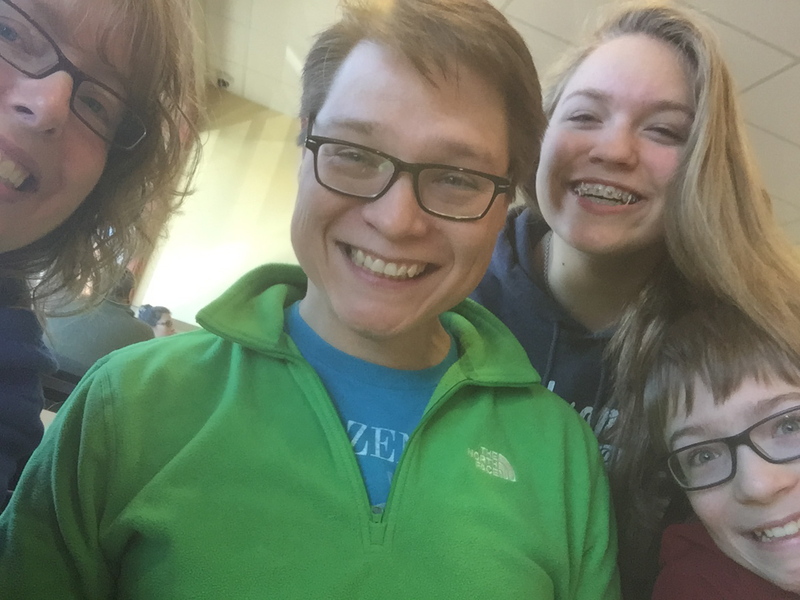 Yesterday was the husband’s birthday, and we started the day by going out for a BIG breakfast. Then he wanted to celebrate it by going antiquing. We managed to hit one huge antique mall, a tiny antique store, and a medium-sized antique mall in around four hours. No yarn, but that doesn’t mean I came home empty-handed. 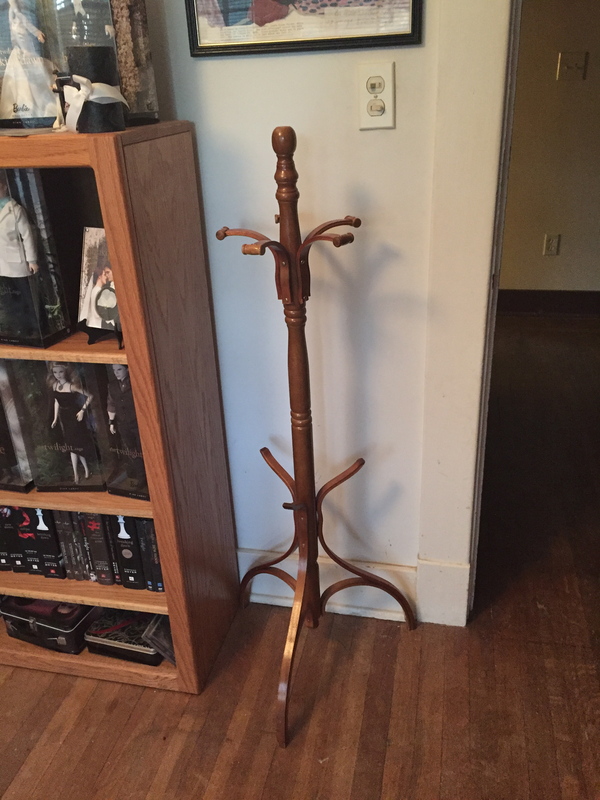 This coat tree is made with cheap “wood” and is a little short, but at $5 it’s a perfect display for my craft shows. It’ll be fantastic for scarves and bags. The top section even twirls! 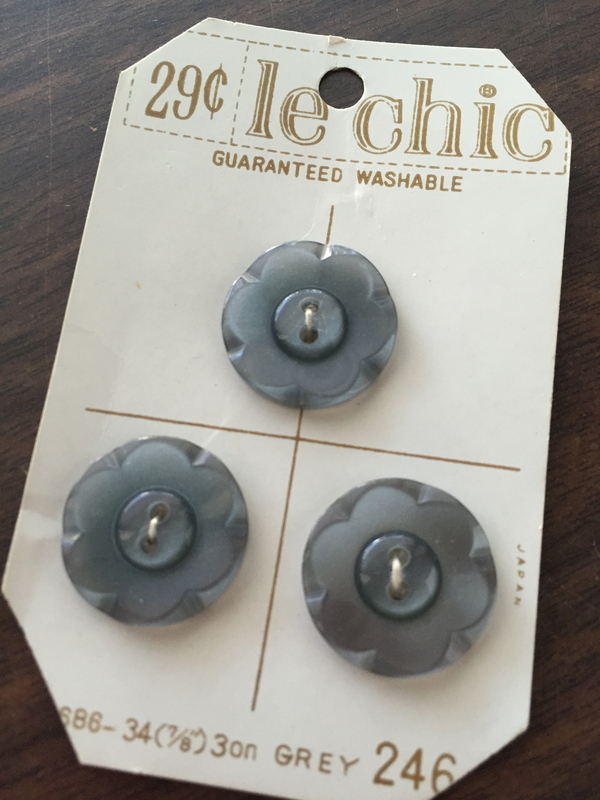 Vintage buttons!! Love them. These are my favorites. I also found a new Joseph Original figurine. (Sorry for the really bad phone photo.) They had four and I only bought one, but I’m really tempted to go back for the others. My first was the dark pink in the back, the one without arms. 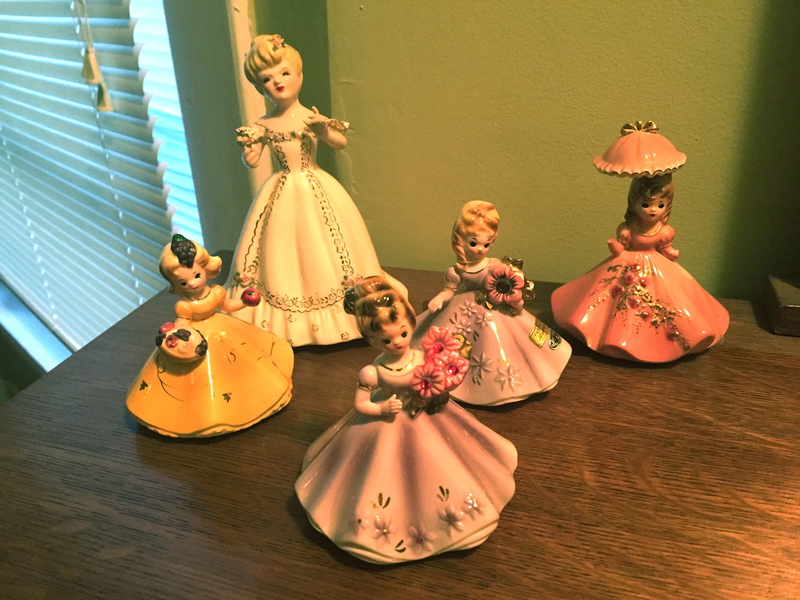 She was given to me by my mom’s mom, and somehow that started a wee collection. Now I look for them every time I’m in an antique store. 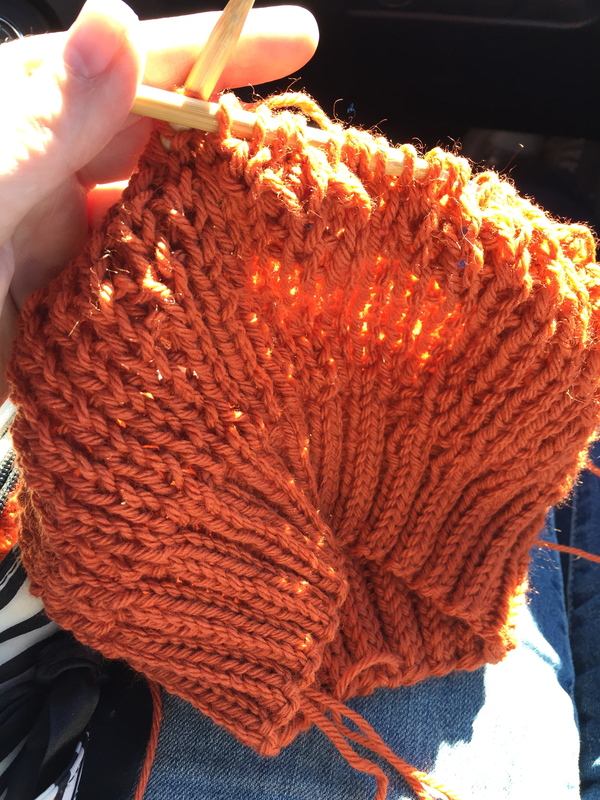 I did manage to get some knitting time in the car while we drove around. And during the game (WOOHOOOOO GO ROYALS!!!! ), I finished it. 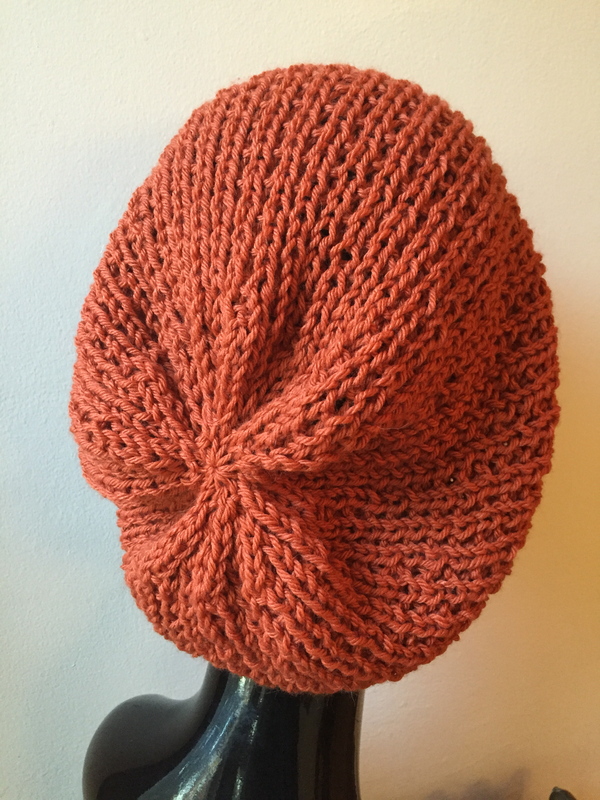 I’m calling it the Pumpkin Slouch Hat and even though I don’t wear orange at all, I really like this hat. I especially like the reverse side! I modified my favorite Broken Rib Slouch Hat pattern for worsted weight, and though it came out a bit bigger than I wanted, I’m calling it a win. I’m a terrible mom, though: my daughter asked if I was selling it. I said yes, I need inventory for the craft show. She asked if she could buy it. I said no, she had more important things to spend her money on. BUT I did say if it didn’t sell at the show, it would be hers (for free, of course). I feel bad, but I’m just really low on hat inventory and I can’t make money without having a good selection of things to sell. Today is sunny and warm so I’m going to take my yarn outside and enjoy the good weather while we have it. Happy November, and best of luck to all of you participating in NaKniSweMo!